Ask Lydia and Mark about any piece of furniture in their home and they’ll tell you an interesting story. From the kitchen island made from an old bookcase salvaged from a skip, to the design classics picked up on camping trips in their VW Campervan, their home is a treasure trove of memories. Even the property itself is the basis for a great tale. Built in 1888, it was a doctors’ surgery until around two years before the couple bought it in 2013, complete with a warren of treatment rooms, a reception area, office and a caretaker’s residence. As the former surgery already had living quarters on the first floor, complete with a small but dated kitchen, it made sense for the couple to live there while they finalised ideas for their renovation project. Mark contacted the architect who had designed the scheme for the proposed five flats, and worked up a new layout using the floorplans for that as the basis of the design. The couple decided to knock down several stud walls that originally formed the many small consultation rooms, creating space for an open-plan kitchen-diner linked to the garden, a more formal dining room and a living room. The first floor would house several bedrooms and two bathrooms, while the second floor would have space for two further bedrooms, a bathroom and a bedroom/home office. Before any work could start, however, Mark and Lydia had to apply to the local authority for permission to change the use of the building from commercial to residential. ‘It took around a year to finally get the go ahead,’ recalls Mark. To make the renovation more manageable, the couple agreed to tackle each floor separately, starting with the ground floor, where the kitchen was top of their to-do list. 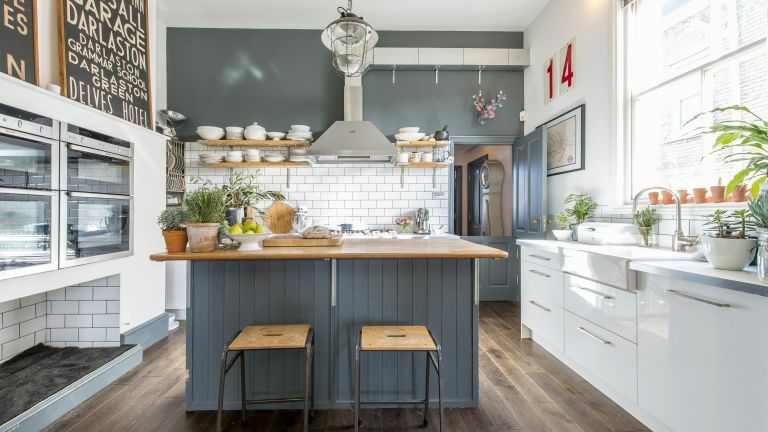 Although Mark planned to tackle a great deal of the work himself, the couple hired builder Spencer Lee to help with the construction work, including removing the necessary walls, fitting bi-fold doors in the kitchen-diner and updating the plumbing. At the rear of the house, a wall was knocked down and two new RSJs installed to open up the layout. Modern Ikea units have been teamed with a large island unit, which Mark cleverly made from an old bookcase. The chimney breast has been put to good use as the perfect spot for integrated appliances, and there’s even space underneath for a built-in bed for the couple’s two dogs, Parker and Angus. The separate dining room at the front of the house is more traditional in style and features a beautiful sash bay window, classic-style furniture and a collection of teapots, cups and saucers left over from Lydia’s time running the café. ‘We love to entertain and cook for friends, so the redesigned layout is ideal,’ says Mark. In keeping with the grand proportions and period details of the main living rooms, the hallway is equally impressive. ‘The old stairs ran along the wall at the back of the house, which made for quite an awkward layout, so we wanted to fit a flight of stairs leading directly from the entrance hall in the centre of the house, but it was important they matched the original style above,’ explains Mark. With a fully functioning kitchen on the ground floor, Mark and Lydia moved their living quarters to the transformed space and saved up to remodel the upper floors. ‘To help finance the rest of the project, we sold a portion of the rear garden to a local builder, who is now building a townhouse on the site,’ explains Lydia. The old kitchen upstairs was turned into a dressing room for Lydia, complete with plenty of storage for her collection of vintage clothes and shoes. The other rooms were converted into spacious bedrooms, all decorated with vintage store finds and an on-trend grey colour palette. Mark and Lydia are putting the finishing touches to the second floor of their property, where the additional bedrooms are now flooded with light thanks to several skylights.